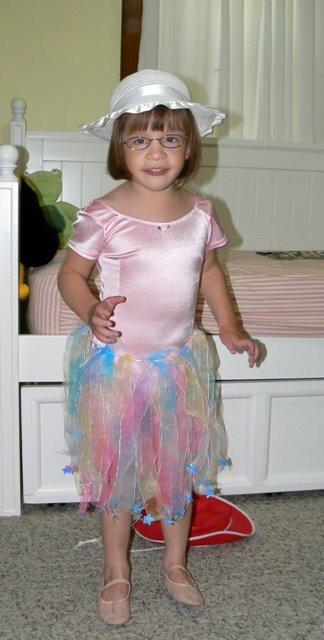 We played dress up this weekend and pulled out the ballet gear gathered from multiple places over a couple years time. This is the first interest Little has had in dress up – well, actually, she has been wearing that hat for over a week and takes it with her everywhere we go – and she has taken to it quite swimmingly. For two days now she has woken up and asked to wear her tutu and ballet shoes. For two days she has kicked her legs and “hopped like a ballerina”. It is ADORABLE. Bubba could not be outdone, so he squeezed his 3T self into the 24M bumble bee costume and ran from room to room singing. Anybody need a 24M bumble bee costume for Halloween? 1 Response to TuTu Cute! Please post some video of Little doing her ballet!